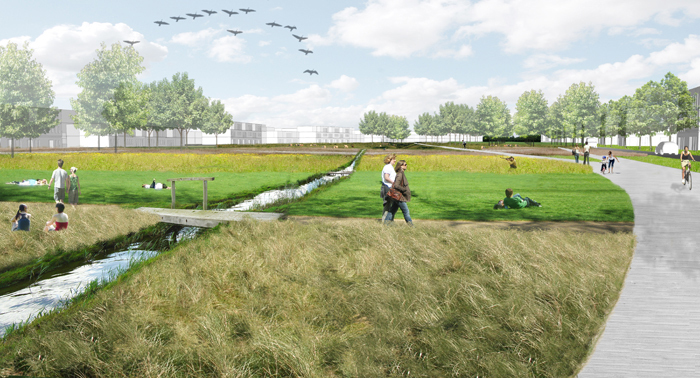 By 2050 an estimation of 1 million extra inhabitants will populate Flanders. This means a total of 7 million people that will want to live in an affordable and qualitative way in the already limited space of the territory. This calls for a new approach to where and how we live. This increase in population is combined with demographic evolutions like: the growth of families with kids, an increase in the +65 and +85 population, the average reduction of the size of families, the increase of newly composed families following divorce and remarriage and foreign migration. How will we combine these changing needs with more affordable and social housing in pleasant neighborhoods using space and energy in an economical way? 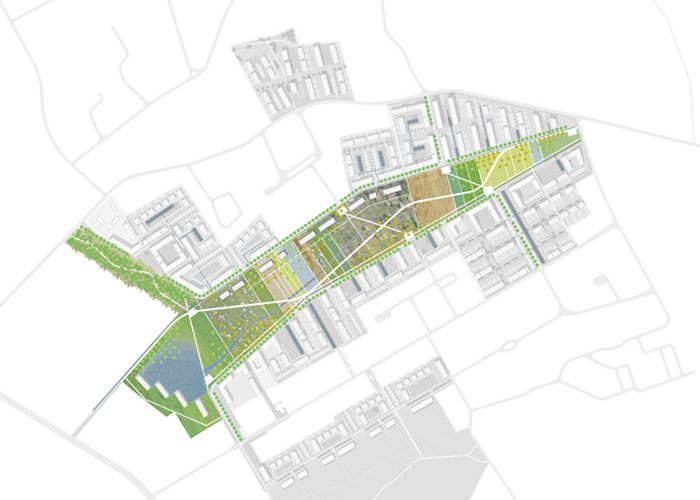 Are we not missing out on opportunities with the traditional approach in which the making of an urbanistic masterplan and the concrete architectural translation are disconnected? Opportunities on the in-between scale, on the collective scale between the private and the public? 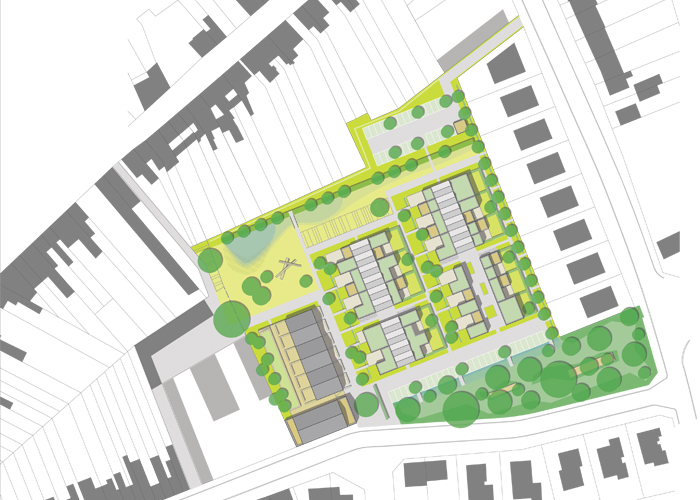 By combining different housing units in a collective typology we can possibly combine some of the qualities of the individual house with a garden with the density of an apartment block? The collective is the scale of the smallest community. The collective is a clustering of housing units in one entity. 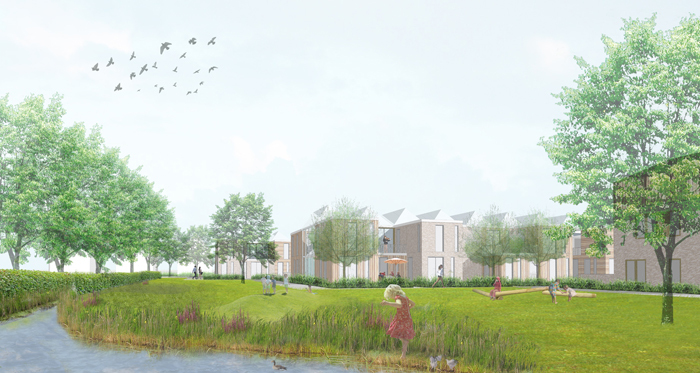 The individual housing unit is brought into a direct relation with a series of others. The collective is big enough to create a feeling of community but not too big to lose it again. Mixing typologies and people is possible but not necessary. It can also be a quality to form a collective entity with persons of the same mind. The scale of the collective can be used to start up projects in which the future inhabitants are included in the development process. Different interested future inhabitants can form building groups taking responsibility to develop a collective project. This way they can lower the costs and work out a personalized made-to-measure project. Other collectively shared functions become a possibility: an atelier, an office space, guest rooms or a multi-purpose room. 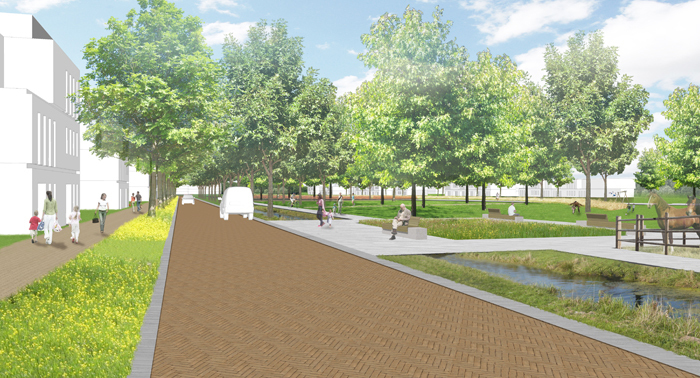 The open space can play an important role in the collective typology. 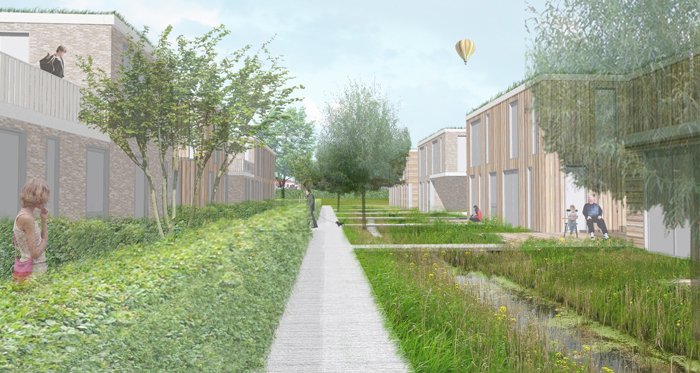 The housing units can be organized around a common open space. It’s an outdoor space that can be appropriated by the residents. It’s complementary to the private outdoor space. Similar to the building this can once more lead to a scale advantage. Instead of chopping up all the open space in private gardens, we combine it into one big collective garden that is accessible to all. Not everybody uses their garden at the same time and in the same way. 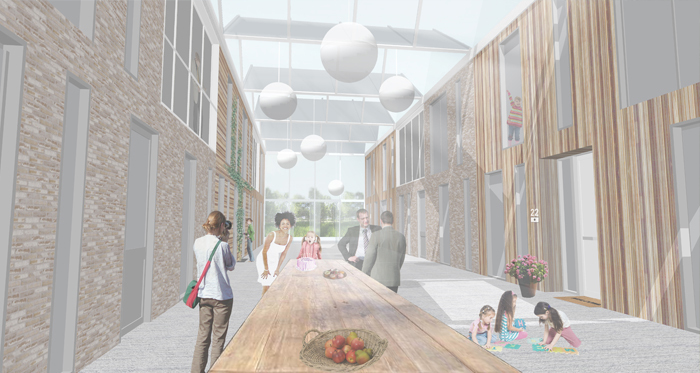 The collective garden flexibly moderates the various en changing needs of all the inhabitants. 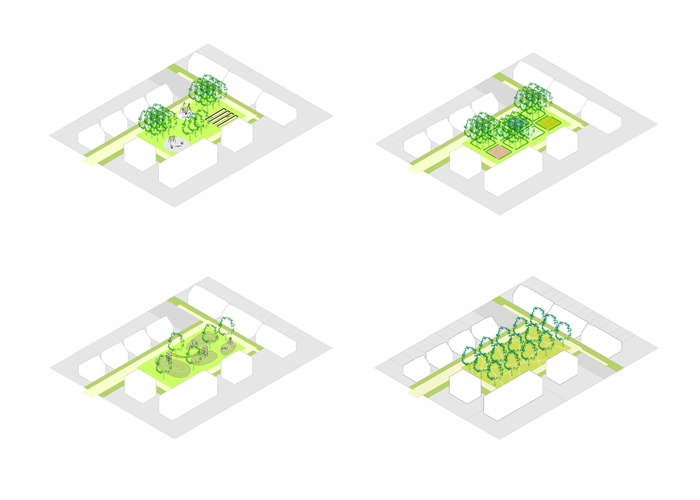 The idea of using the collective as a scale in-between the individual house and the urban scale allows us to look into new possibilities for collective infrastructure like energy creation, water purification, traffic and parking solutions,… Is it not more logical and effective to apply certain technical solutions on the collective scale instead of on the scale of every individual house? We should look for scale advantages and thus cost reduction (higher effectivity, lower installation cost). 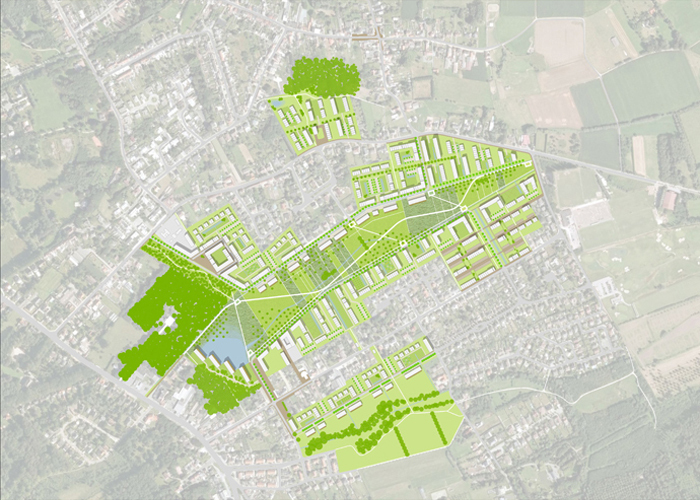 We also have more possibilities of reducing the spatial impact of these technical amenities on the collective scale. BRUT has worked on many projects concerning new housing developments. Every time this collective scale came up in different shapes and colors. We included some images on this page.